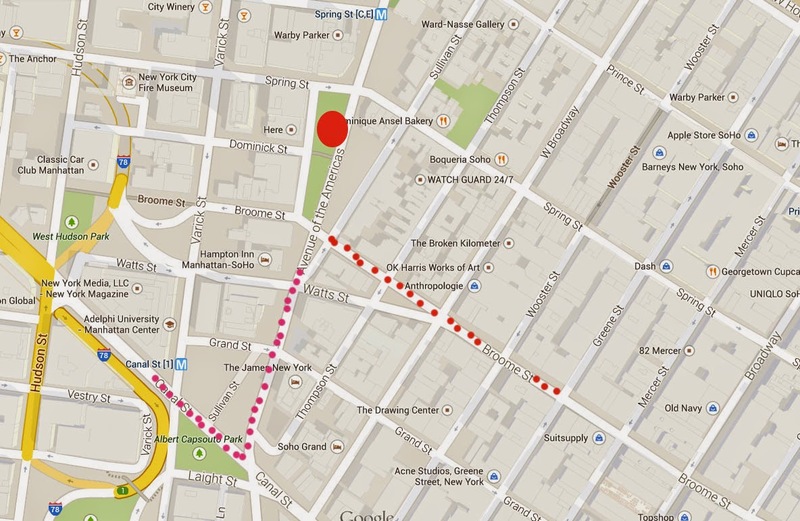 This year marks the 41st New York’s Village Halloween Parade. Forty years ago Greenwich puppeteer Ralph Lee Ralph Lee started this tradition. In 1974 it was just a walk from house to house for his children and their friends. Last year about 50,000 folks parade up Sixth Avenue—decked out in some of the City's scariest, most inventive and most hilarious costumes. It is difficult to determine the distinction between participant and spectator- many in the audience are themselves in costume. The year before the last in 2012 there were no parade for the first time in the 40 years of the parade history- there were no power in downtown! Hurricane Sandy was in full swing. Last year after more than 5 years break I put on a wig and a mask and took part in the parade. You can read about 2013 parade in my post. I plan to do the same this year. 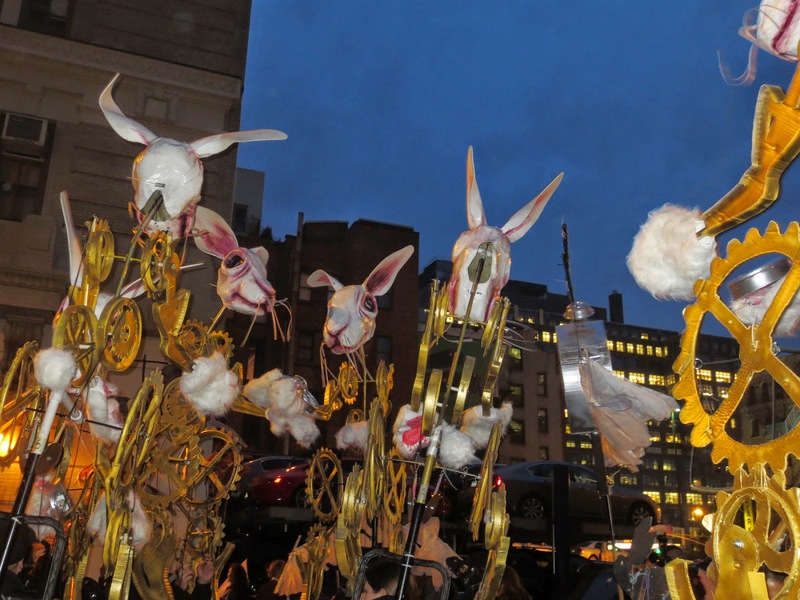 Official parade web site theme statement is very exciting : "This year we celebrate the JOY of finding our tribe— so this year’s celebration is about YOU and the secret garden of the Village Halloween Parade where all of you Earthly Delights gather in the landscape of New York City. 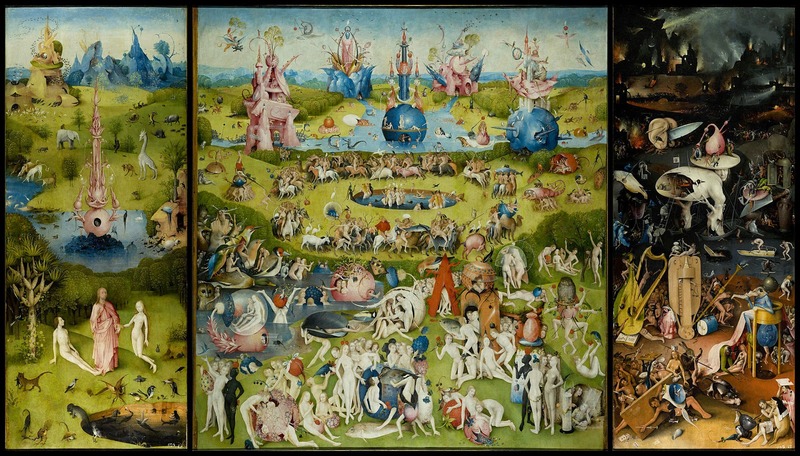 So, our 2014 Theme is: The Garden of Earthly Delights! Although one often associates Halloween with things Infernal, this year’s Halloween Parade is headed to Paradise, or more specifically the Garden of Earthly Delights. Join us as we unearth the layers of Heironymous Bosch’s timeless altarpiece, exploring the precarious borderland Garden between the primeval terrors of wilderness and the modern confines of civility". Artistic and Producing Director Jeanne Fleming commented, "The New York Village Halloween Parade has always been a secret garden of sorts, a place where for 40 years, wildness of every rare variety has flourished within the high walls of New York's avenues." Whoopi Goldberg is the grand marshal of the Halloween Parade 2014. The puppeteers will create a big tree of life with an assortment of flowers and fruits hanging. 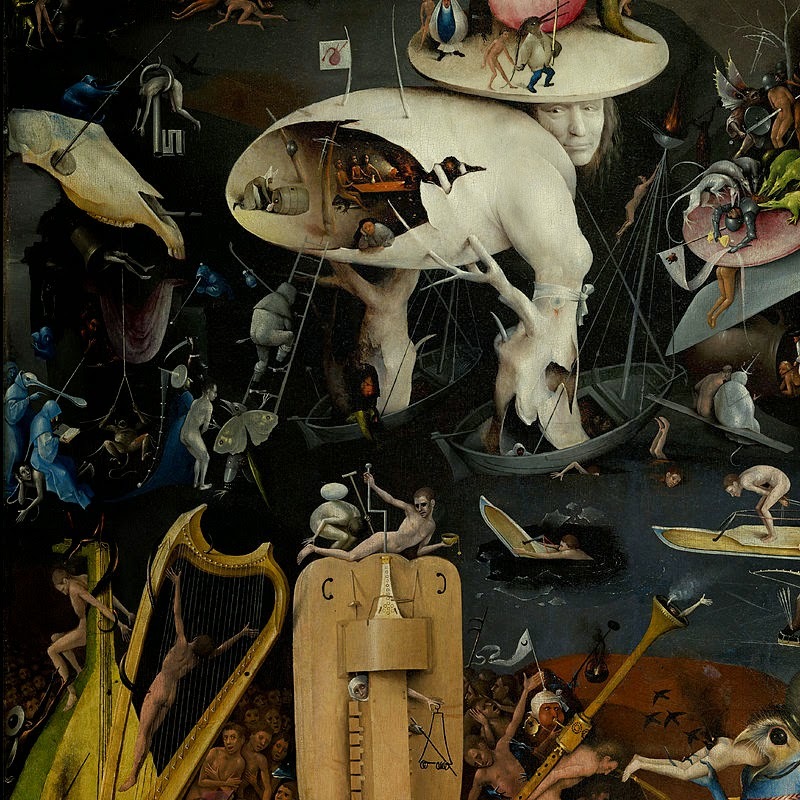 Hieronymus Bosch's "The Garden of Earthly Delights" stands as one of the most famous paintings in Western art history, and one of the most influential, inspirational works for Surrealist painters of the 20th century . 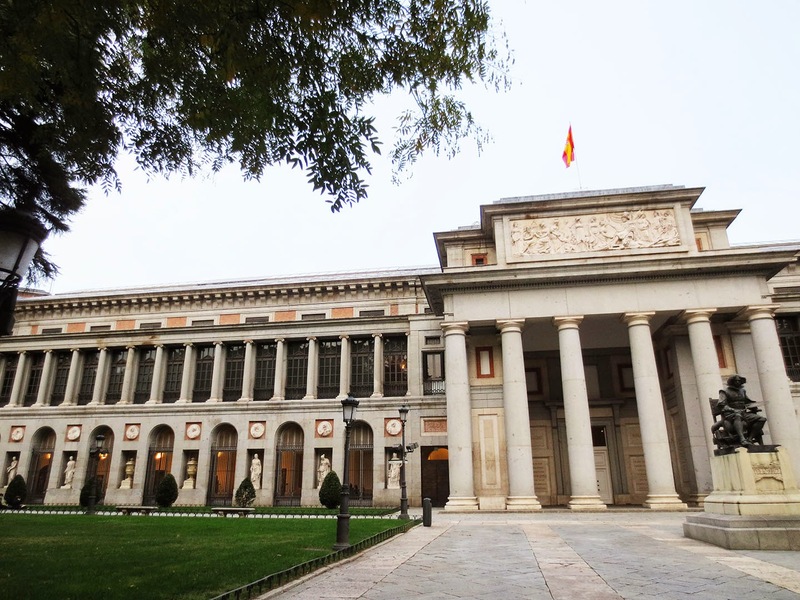 You can see this masterpiece in the Museo del Prado in Madrid where it housed since 1939. The exact date of the painting is unknown because Bosch never dated any of his pieces. It is his best-known and most ambitious complete work. Bosch’s Garden of Earthly Delights consists of four images. When the panels are all closed, the front of the triptych shows a gray-tone image in which God sits at the top left corner, watching over the world encased in a glass globe on the third day of creation, The very left panel, Paradise, shows the sixth day of creation, when God created man and woman, the central panel is Imaginary Paradise and the right panel shows Hell . The picture was registered in the inventory of the Spanish Crown as “the picture with the strawberry-tree fruits”. Amongst Bosch’s greatest fans was the Spanish King Philips II, who had the Escorial in Madrid decorated with his works. If you'd like to watch the parade this year you have to know that there are so many people there that if people do not get there early, they will have a hard time seeing anything at all. Only those in costume are permitted to participate in the parade itself although people in and out of costume can and do watch from the side lines.